who was the favored servant of the millionaire. He contemplates what to do. and is soon apprehended in New York. 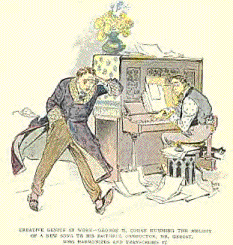 With the police closing in on her, Mrs.
house, and her magnificent control of comic repose." "Think you can write a play without a flag?" made a hit with Erlanger. He never said so, but I could tell. 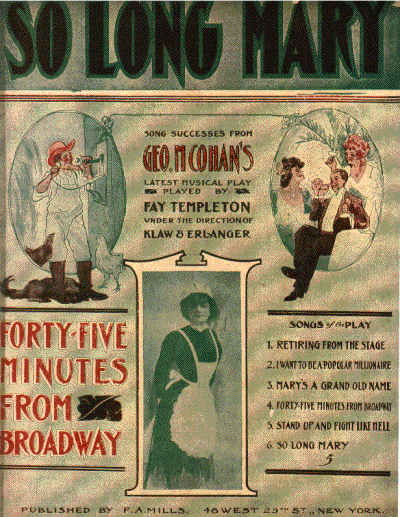 "We (Cohan & Harris) produced "45 Minutes From Broadway" in Columbus, Ohio. 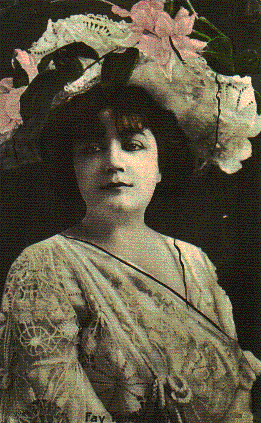 cities, and Fay Templeton scored one of the notable successes of her career. 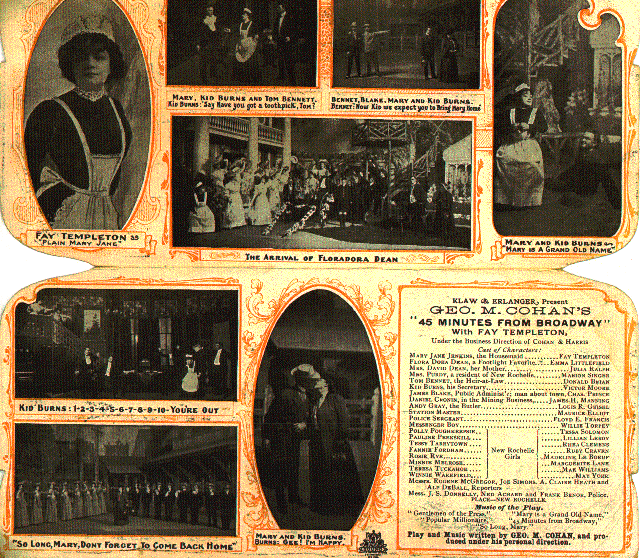 The two song hits of the play, "Mary's a Grand Old Name" and "So Long Mary,"
by the dramatic critics of the play itself. "ad," and a little later on I was tipped off that the Columbus critic lost his job." and solidified the producing team of Cohan & Harris on Broadway. "When We Are M-A-double R-I-E-D."
turned to him and asked, "Sam, you'll be seeing George, won't you?" "Sure,"
I'm saddle sore," stated the star. Cohan roared over the story for years after. where she appeared opposite Bob Hope, George Murphy, & Sidney Greenstreet. I would appreciate hearing from them. 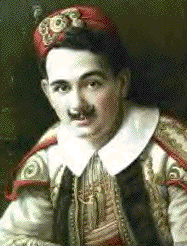 in the revival of "The Chocolate Soldier" (1921), portraying Lieutenant Burnerli. He continued to work in the theater until he retired in 1934. Donald Brian in "The Merry Widow"
For Victor Moore the Cohan and Harris discovery, "45 MInutes From Broadway"
"Funny Face" (1927), and the Nobel prize winning musical "Of Thee I Sing"
away at the age of 86. "Forty Five Minutes From Broadway"
The show was once again revived in 1959 in a TV special for the "Omnibus"
Blyden as Kid Burns. 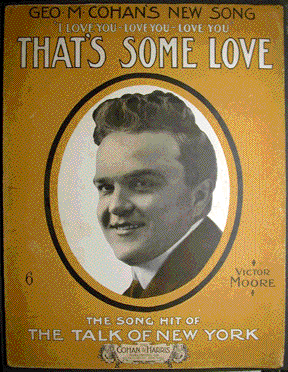 It's soundtrack was released by AEI Records in 1986.
standards displayed in Cohan tributes. more reminiscent of "George M!") with the same title.